The Rottweiler Club is the first specialist club for the breed, founded in 1960. Our aim is to promote the well being and public image of the breed now and for the future. We hold two shows annually – a Championship Show and an Open Show. We also offer Talks, Fun Days, Temperament Assessments and an annual Yearbook. There were very few Rottweilers in the country in 1958 so when they appeared in public, they generated enormous interest. People then did not think of them as being big fierce guards, but as handsome and noble in appearance, intelligent and above all, different. Mrs. Joanna Chadwick [Mallion] showed her imported German dog, Rudi Eulenspiegel of Mallion, in variety classes where he attracted a great deal of attention and brought the breed to the notice of a wider public. In order to get the breed better known, all sorts of people showed their dogs, which were good, not so good and sometimes rather indifferent, to enable classes to be scheduled at shows. Owners were scattered widely throughout the country, with the Home Counties having the largest proportion and, apart from the occasional show with breed classes, owners did not meet very often. The first meeting of those interested in forming The Rottweiler Club was held at Crufts in February 1960, with an attendance of 15. Of the original 15 Mary MacPhail is the only one still active in the Club having served as an Officer and Committee Member for 50 years without a break. This was the first time the breed had been classified at this show and the judge was Mrs. Winnie Barber. Sixteen Rottweilers were entered and, of these, three had the Working Trials qualifications of CDex and UDex. In April 1960, Kennel Club approval was received and so The Rottweiler Club was officially born. Mrs. Thelma Gray was elected President, Captain Roy Smith MRCVS, Chairman, Mrs. Wait, Secretary and Mary Macphail as Treasurer with a committee consisting of the late Mrs B Baxter, formerly Bensley, Mrs Chadwick, Miss Cole, Mr Garland, Mrs Gawthrop, Mr McGloin, Mr Powley and Mrs Wheatcroft. A point of great concern to the Rottweiler Club committee was the preservation of good temperament and working ability and, with the former in mind, a Club Character Test was evolved; the first test took place in 1961 and tests have been held every year since. As registrations slowly but steadily increased, so did the number of shows offering Rottweiler classes. More owners joined The Rottweiler Club and it was from these small beginnings that the Club grew to its present size and complexity with many facets to consider – shows, working events, rallies, seminars, newletters etc. The first Club social rally was arranged in July 1962 which was a great success. The Club met regularly and membership soon swelled to 700. They organised training sessions and shows and created a welfare scheme. In 1965 what the Club set out to do was basically to produce in English, the then German standard. The only amendments the Club wished to make were where the German standard contravened the general guidelines, as laid down by the Kennel Club. The Club was most anxious to capture the “spirit” of the German translation, and that nothing was included which would lead to an unsound animal or anything, which if exaggerated, could act to the dog’s detriment. The second major task that the Club undertook was to get Kennel Club agreement to grant the breed a separate register. This meant that Challenge Certificates would be on offer for the Rottweiler. This was in fact, tied to the breed standard, which was approved as part of the procedure for giving the breed a separate register. The requirements were for 300 dogs to have been registered over three years, with 150 registered in the last year. This was achieved and the Club had four sets of CCs for 1966 starting with Crufts. 1967 saw 16 Rottweilers at Crufts and 25 in 1968. 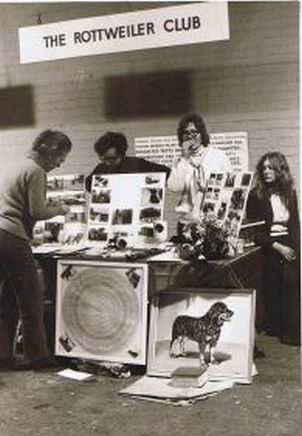 The next major step for the Club was the Kennel Club’s approval for The Rottweiler Club to hold its own Breed Club Championship Show. Gradually, as interest in the breed grew, branches were established in other parts of the country, which eventually went on to become breed clubs in their own right. There are now 10 Rottweiler breed clubs nationwide and details of these clubs may be found in the Links page. We welcome all new members to the Club. If you would like to join, please download and view our membership documents below, then complete and send to our membership Secretary along with the membership fee. If you have any questions about membership please contact the membership secretary via the contact page. If you are renewing your Membership and use Internet Banking, you can send a bank transfer for the current annual subscription of £12 to our bank account. Once you have sent the transfer please email the Membership Secretary with your name, address and when the money was transferred. Alternatively, you can renew using the form and sending cheque or setting up a bankers order, (forms below).